This past Saturday, I was visiting my parents when their neighbor pulled up in a golf cart. I went out to talk with him and noticed a couple of fishing poles in the back of the cart. He wanted to spend some time fishing in the pond behind the house. We talked for a few minutes, and he talked about the beauty of the land around us. I thanked him and told him how much I liked the farm from which he had just moved. I told him that I remembered my parents taking me on Sunday drives when I was a kid and how we used to drive by his place. He asked me if I remembered when Paul McCartney lived on his farm in the early 1970s. I was too young to remember that, but I told him that I have heard a bunch of stories about it. 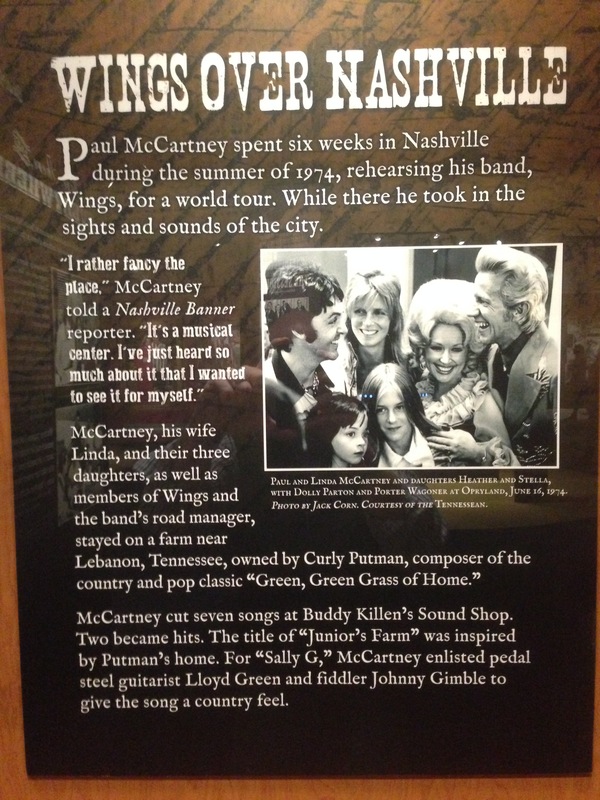 He was also glad to hear that the Country Music Hall of Fame has a panel about McCartney’s time on the farm in their latest exhibit. I was talking to Curly Putman, and his farm was immortalized by Paul McCartney in a song called “Junior’s Farm.” However, Mr. Putman is more than just a man who sold his farm and moved close to my parents. 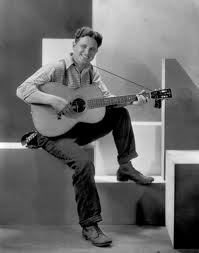 He is also one of the music’s most accomplished and successful songwriters. Not long after we started talking, my parents came out to visit, and I drove to the pond to open the gate. On the way back, I stopped and talked some more with Mr. Putman. We talked about how many people consider his song “He Stopped Loving Her Today” to be the greatest Country song of all time. However, “Green, Green Grass of Home” has always been my favorite. Mr. Putman said that it is also one of his favorites because it has been recorded by more than 700 artists. A song that was not a big hit when it first came out has stood the test of time. I did not want to keep Mr. Putman from fishing. I pulled away as he rode toward the pond. However, I hope that I get to talk to him again and find out how he can sit down and write a song. My wife said that I had to remember that line because it would make a great title for a blog post. I knew that she was right, but I had no idea what should go under that title. Now, I may have figured it out. I am a fan of most musical genres, but Rock has always been my favorite. It is a genre that changed the musical landscape in the 1950s and found itself changed in the decades that followed. Rock and Roll. Psychedelic Rock. Prog Rock. Punk Rock. Glam Rock. Southern Rock. Heavy Metal. There are different styles. They are all Rock, and I like them all. I could list many Rock Stars, but the list would go on and on. Instead, all the Rock Stars and Rock Bands, no matter the style, fit within the lines of an AC/DC song. Using the past tense is fitting because Rock is dead. Some people are going to argue that point and mention that Rock Bands still exist. That is true. However, Rock as the dominant genre is dead. In my opinion, current Rock Bands perform on the fringes of popular music. In the old days, Rock Bands were the leaders of popular music. They ruled the airwaves and the charts. All of that ended when Guns N’ Roses broke up. This does not mean that it is the fault of Guns N’ Roses. Plenty of groups before them broke apart, and they were only following an established pattern. The difference is that there was, in my opinion, no Rock Band to replace them. They were replaced by Grunge. The flamboyant clothes were replaced by cardigan sweaters. Rock Bands still tour and fill up arenas, but they are the bands of old playing for people reminiscing about their younger days. The Rock Stars are graying, and their fans are retiring. It is strange to hear someone who qualifies for AARP singing lyrics that relay the feelings and thoughts of their younger selves. When I was in high school, there was an awesome Rock station in Nashville. 103.3 WKDF played all of the great stuff. I laid in my bed with headphones over my ears and listened to Metal Shop. Many years ago, that station changed to a Country format. It was a sad day, but it was a fitting and smart business decision. 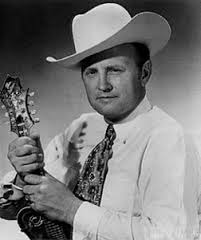 At times, I lament that state of Country music. The genre should be a singer standing behind a microphone and singing about heartbreak and loss. Instead, it is a genre about partying and having a good time. 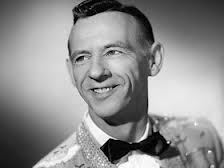 A contemporary Country concert would be unfamiliar to Hank Snow, Patsy Cline, Roy Acuff and others. However, it is familiar to me because it has sound, light, drums and guitar. Country has filled the void of Rock. 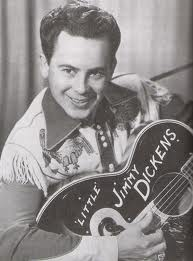 Today’s Country fans would have been Rock fans in the past. A while back, we went to a Kenny Chesney concert, and Joe Walsh, a guitarist who epitomizes Rock music and its culture, was his special guest. At the time, I thought it strange. However, it was the only place for Joe Walsh to go. I know the history of music from the 1990s until now. I know the bands and the singers. However, I still think Guns N’ Roses was the last great Rock Band. 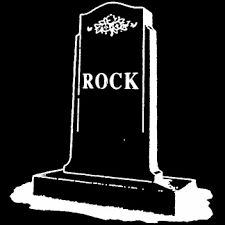 When they broke up, Rock as I knew it died. Several weeks ago, my wife and I hiked some trails around the Harpeth River. As we walked, we saw people kayaking, and she has been wanting to kayak ever since. Yesterday, we decided to spend some family time on the water, so my wife, my stepdaughter and I headed out for a day of outdoor adventure. Unfortunately, there are no pictures for this post because we were afraid out phones would get wet. I only have this emblem from the kayak company to break the monotony of words. 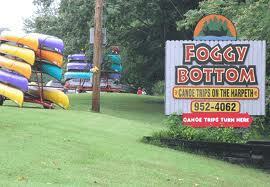 Luckily, we called ahead to Foggy Bottom, the kayak renting place, because it was packed with people on a waiting list. Within a few minutes of arriving, we were on a van filled with anticipation. When we arrived at the put in spot, I helped the driver take kayaks to the water while my wife and stepdaughter stood on the bank arguing over who was going to get the cool one that they saw. That is when a guy told them that they could stop arguing because it was his personal kayak. The driver told us that we would get out at the bridge, and, with that information, we shoved off into the great unknown with a ton of other people. We paddled for a while. We floating for a while. It was all very relaxing, and, when I get relaxed, I start to think. That is why I do my best thinking when I first get into bed. The first thing to hit me was a song. When that one came to mind, they started flooding in. “Proud Mary” by Ike and Tina Turner. It is better than the CCR version. “Somewhere Down the Crazy River” by Robbie Robertson. I wrote a terrible post about it. “Take Me to the River” by Al Green but made famous by that mounted fish. “We Shall Gather at the River” by various people in almost every John Ford movie. I was having so much fun that I started to sing a few of them. My wife looked at me warily. When I wondered aloud about how many songs are about rivers, she looked at me like I was crazy. My thoughts were interrupted when we hit our first rapids. Well, they were not really rapids. It was more like water running over some rocks. Embarrassingly, I got spun around. More embarrassingly, it happened each time we hit a little rapids. My wife and stepdaughter were a lot better with the wild and raging waters. It was during one of these spins that I started thinking about Native Americans. I teach about how many of the tribes lived along the rivers and how those waterways were their interstates. In all of those lectures, I never realized how hard that would have been. I am sure they used the Harpeth, but they also used rivers a lot bigger and wilder than this one. Then, it happened. The clouds began to build up, and we heard thunder. Not long after, we saw lightning in the distance. Around the same time, we hit another small rapids, and I got stuck. My wife and stepdaughter, in an attempt to outrun the storm, took off. Once I got myself unstuck, I was paddling alone as the clouds darkened. There I was. Clouds darkening overhead. Lightning flashing all around. Me sitting on a little boat in the middle of the water. I decided not to worry about it because there was nowhere to go. Lightning would probably strike the tallest thing around, and that would be some tree. If I stayed in the middle, then a falling tree would not hit me. Certainly, this is the plan that a Native American in a canoe would have followed. It started to rain, but I was already wet. I made the decision to paddle until I caught up with the rest of my family. That took a while. Eventually, the rain went away; I caught up; and I began to ponder some of the things that we had seen. Along the way, there were several places where people could stop their boats and get out. We did not do that because my stepdaughter was focused on getting to that bridge. However, I watched the people as we floated by. They drank beer. Actually, it must have been a lot of beer by the looks of some of the bellies on the guys. There was one couple making out on a log where they thought they could not be seen. Where there was a road access, people pulled up in their pickup trucks. That is when it hit me. We had been floating through one of those Country songs that you hear on the radio all of the time. It was almost like the Pirates of the Caribbean ride at Disney World, where you ride a boat and watch the animatronic pirates attack a town. The pirate song plays as you go from spot to spot. This was the Country song version of that with real people on the banks. When those guys get in their tight jeans and jump around on stage, this is what they are singing about. However, it looked different from I imagine when I hear one of the songs on the radio. When the guy sings about riding to the river in his pickup truck and the girl has her bare feet on the dashboard, I picture a good-looking girl that you might see in the video. Yesterday, I did not see her. To the relief of my stepdaughter, we made it to the bridge and a throng of people trying to get on vans. We thought it was going to be a struggle, but we made it out rather quickly. My wife and stepdaughter crammed into a space for one, and I hopped in with the coolers in back. We made it back home but were worn out and sore. I picked up a pizza, and we spent the rest of the night trying not to move. I cannot wait to go back again. Kayaking was really fun. Next time, I want to stop at one of those spots and see what it is like to take part in a Country song. That good-looking girl I imagine will be with me because I married her. Living near Nashville has many perks but being around a lot of great music is at the top of the list. You can go almost anywhere and hear talented people. However, there is one place that stands above the rest. The Ryman Auditorium sits downtown and was, for many years, home of the Grand Ole Opry, the radio show that put the music into Music City. I have been to the “Mother Church” many times for many types of concerts, but Friday night brought a completely different experience. Necole and I were able to go backstage at the Ryman for the Grand Ole Opry, which moves back to its home during the offseason. Our hosts were Dr. Bob and Leslin, his daughter. Leslin was one of my students and has a great blog. They were able to get us in because Dr. Bob is the doctor who many stars see when they have issues with their voice. He knows a lot of performers and was able to provide us with this special experience. We started the evening with a great meal at Sperry’s, one of Nashville’s dining institutions. 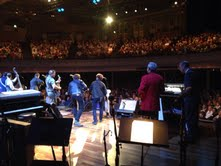 Then, we headed to the Ryman. I was worried about getting a parking space because Justin Timberlake was performing across the street, but Dr. Bob and Leslin had that taken care of. We parked in the lot reserved for the Opry performers. We walked through the alley between the Ryman and Nashville’s famous honky tonks. We made it to the backstage entrance, and the history began to hit me. Country legends had climbed those same steps to perform for a packed house and countless people listening across the nation on WSM radio. When their set was finished, they would walk back down the steps to the bars across the alley. That’s where they would kill time until the second show. Up the stairs was a man at a desk with a list of names. Once we got past him, we walk through the door and were on the stage. The show had already started. Music was playing, and the crowd was clapping. Immediately, one of the backup singers hugged Dr. Bob and told us to come on up. We ended up standing next to the backup singers. Everyone in the audience could see us. In front of us was the announcer who introduces the acts and reads the commercials. Eventually, he walked over and talked to us. At the first break in the action, I took a picture of what was going on behind the curtain. Necole and I were amazed at the casual atmosphere. As the music played, people were talking and joking around. It was like a big family reunion. The hallways were small, and people couldn’t help but bump into each other. At one point, Dr. Bob wanted to introduce us to someone. We walked over and had a good conversation about music and life in Middle Tennessee. He asked about our jobs, and we asked about his. Around the corner, Riders in the Sky were practicing, and Necole became more interested in them than the conversation. She had to have a picture, and I took it. I am not great a picture-taking, so the blurriness is the fault of the photographer. Later, the accordion player asked me what I did for a living. When I told him that I was a historian who researched the American West, he nearly fell out. 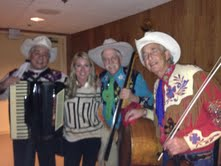 He wanted to talk all about the history of cowboys and their music. That’s when I told him about the magazine I had that listed them as one of the top 50 artists of the Western music genre. He acted like he didn’t know it. We went back to the stage in time to see an elderly lady perform. The crowd was cheering enough for us to know that she was a major star, but we couldn’t tell who she was. 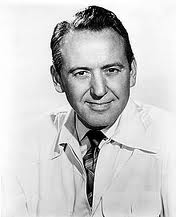 Dr. Bob found out that it was Jean Shephard. None of my group recognized the name, so I got to show them some of my knowledge of music history. She was a big star in the 50s and 60s but faced terrible tragedy. Hawkshaw Hawkins, her husband, died in the same plane crash that killed Patsy Cline. Eventually, it was time for the last segment, and the host walked into the wings. At first, all we could see was his red coat. When he turned around, we saw that it was Jim Ed Brown, another great star of the past. He sang a few songs before introducing the band that we had come to see – Old Crow Medicine Show. The newest members of the Opry brought down the house with an energetic performance that included “Wagon Wheel“, which was their song before it was Darius Rucker’s. That’s when Necole and I realized that the guy we talked to earlier (back when Riders in the Sky was practicing) was the lead singer of Old Crow Medicine Show. Everyone around us was taking pictures. This is one that I took. That’s Jim Ed in the red coat, and the announcer standing next to him. The crowd loved Old Crow Medicine Show to the point that Jim Ed gave up his last song for them to be able to sing another one. After the show, we walked back down the steps and into the alley. People were lined up to get into the honky tonks, and music could be heard coming from all of them. That’s when I realized that the alley is only a few feet across, but there is a long way from those stages to the one we just stood on. The Highwaymen came up on my iPod. 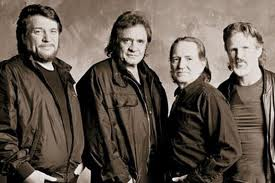 That was an 80s country super group consisting of Willie Nelson, Kris Kristofferson, Waylon Jennings and Johnny Cash. In the 80s, each of them were legends. Now, they are icons. 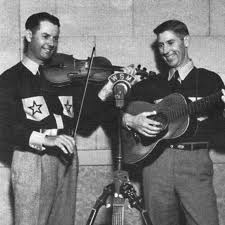 When they first recorded together, there wasn’t a name for the group. Then, “The Highwayman“, one of their first songs, went to Number One. That was the song that came up on my iPod. I hadn’t heard it in a while, but the words were still familiar enough for me to remember. As the song played and I sang along, I began to think about its subject matter – reincarnation. Then, I realized that there was once another hit country song about a reincarnation-like theme. 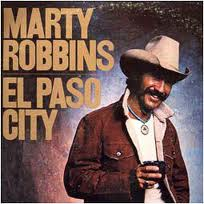 That was “El Paso City” by Marty Robbins. It went to Number One in the 70s. These were two songs by major artists that tackled a controversial subject matter. Did the listeners who turned them into hits realize what they were about? If yes, then did they even care? These questions went through my mind along with another one. Would these songs make it to the radio in today’s market? For a couple of reasons, I think the answer is no. In the past decade, mainstream country music has attached itself to right-wing conservatism. That means that a great deal of its target audience is of the Christian faith, and, obviously, reincarnation does not fit within that belief. However, I would think that Christians also listened to country music in the 70s and 80s and probably bought the records by The Highwaymen and Marty Robbins. What is different now? Has there been an awakening of religion in the past decade? Were country music listeners in the 70s and 80s less religious than today? No matter the answers, country labels are scared to test the waters. There is another reason these songs would not make it on today’s radio. They are not about pickup trucks; John Deere tractors; girls in sundresses; drinking beer on a back road; or anything else that is stereotypically country or southern. Obviously, these songs sell, but they all sound the same and are sung by people who sound just as similar. By the way, they kind of look alike, too. The older songs are about deep, if controversial, subjects written by talented tunesmiths who were able to take such a subject and make an entertaining song that is also thought-provoking. They were also sung by talented artists who did not have to cover themselves in pyrotechnics and voice enhancements. Marty Robbins and The Highwaymen may not have all been great singers, but they were great artists. Today, labels are afraid to push someone who does not fit the formula of looks and sound that form a cookie cutter industry. If that had been the case in the past decades, then Marty Robbins, Willie Nelson, Kris Kristofferson, Waylon Jennings and Johnny Cash would have never gotten into the front door. Now that I write that, they almost didn’t, and that would have been a shame. 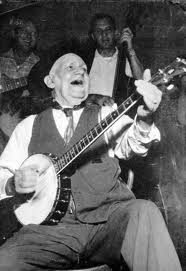 That’s it for my critique of the evolution of country music. Now, on to the next part of this post. I do not believe in reincarnation. It always seemed silly to me to think that our souls jump from generation to generation. On top of that, people who claim to be reincarnated always say that they used to be someone famous or adventurous. 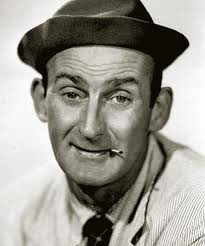 I have never seen someone on television who claimed to have been some guy who dug ditches for a living. In the last life, I was Upton Sinclair. That’s a pretty famous person. Before that, I could have been Henry James Montague, a British actor. Another jump across the pond brings me to Pehr Osbeck, a Swedish explorer. It’s Sir Christopher Wren. Hey, he’s pretty smart. That brings me to Kutsuki Mototsuna, a Japanese samurai commander. Pope Paul III pops up. It’s good to be pope. Johannes Gutenberg! Man, this list is filled with some influential people. Here comes Acamapichtli, Aztec ruler. Things might have been different if he was around when Hernan Cortes showed up. That’s as far as the chain goes. There’s no way of knowing what happened before that. Google went into overload. I suppose it’s a good place to stop this critique of country music and reincarnation. Friday night, I went to a country concert with Necole and her mom. I am not sure what I was expecting, but it was the best country music concert that I have seen in a long time. Will Hoge opened for Gary Allan at the Ryman Auditorium, the Mother Church of country music. As one of the guys said, this was the room that made the music industry in Nashville. The Ryman is one of my favorite places, but this post is not about that. It’s about two performers, neither of which I had ever heard of, who restored my faith in country music. There was an entire concert with no songs about tractors, tailgates, back roads or any other southern stereotype that most people in this nation can’t relate to. These songs had depth and sophistication. They were filled with hope and despair. In short, they were what country music used to be and what is should continue to be. 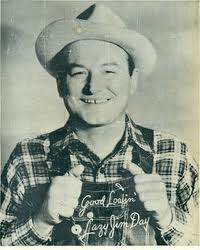 Country music is filled with guys who sing about growing up on a farm when they probably grew up in some suburb. The performers I saw were true to themselves. 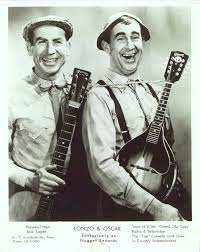 Of course, the “fake redneck” brigade plays to sold out arenas, and these guys were in a small venue. I reckon that says something. I liked most of the songs, but the last one by Gary Allan stood out to me. Songs About Rain is about a man driving around with heartache. The love of his life has married someone else, and his radio is playing nothing but songs about rain. The song hit me because that is what a country song is supposed to be about. It also hit me that there really are a bunch of songs about rain, and my mind started working. Why is that? It could be that rain depresses people, so it provides the appropriate feel for a sad song. It could also be that rain is an easy word to rhyme. Pain. Train. Plane. The word works on different levels. Then, I started thinking about the songs on my iPod that are about rain. It is filled with them. There are songs about rain in different genres and from a wide variety of artists. Like other entries in the “My iPod Has Issues” series, I have put my iPod on shuffle to see what kind of rain songs come out. “November Rain” by Guns N’ Roses – This one may have the greatest video ever. 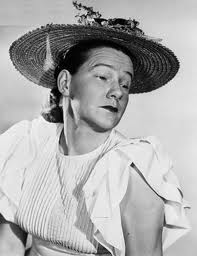 “Blue Eyes Crying in the Rain” by Willie Nelson – Now, this is a country song. “Looking for a Rainbow” by Chris Rea – Not many people have heard of him, but he is one of my favorites. “Crying in the Rain” by Whitesnake – It’s a little different from Willie’s song. “Rainy Night in Georgia” by Tony Joe White – Georgia says they need water. Maybe this song will help. “Rain” by the Beatles – This is not my favorite song about rain. “Rainy Day People” by Gordon Lightfoot – He is one of Canada’s greatest exports. “She’s a Rainbow” by the Rolling Stones – This one is better that the British Invasion one above. “Raindrops Keep Falling on My Head” by B.J. Thomas – They say it was my favorite song as a little kid. “Purple Rain” by Prince – He ended his concert with this when I saw him. “I Wish It Would Rain Down” by Phil Collins – I used to listen to this during every state of depression. “Kentucky Rain” by Elvis Presley – No list is complete without an Elvis song. “Early Morning Rain” by Elvis Presley – To prove the previous point, here is another one. “Rainy Day Women #12 & #35” by Bob Dylan – I’m not sure what it has to do with rain. “Rainbow Stew” by Merle Haggard – Now, here is a happy rain song. “Just Walkin’ in the Rain” by the Prisonaires – This song has a sad true story behind it. “Fire and Rain” by James Taylor – I have always found this song haunting. Most people probably know that Nashville is known as “Music City”, and those same people probably know that it is called that because of the country music industry. Nashville actually has been a hotbed of several musical genres. At one time, there was a strong R&B scene, and Jimi Hendrix honed his craft in the clubs on Jefferson Street. Bob Dylan spent a great deal of time in the city, and Elvis Presley recorded here all the time. Heck, the Black Keys and Jack White currently call Nashville home. Despite a diverse history, country music was and continues to be the dominating form, and, these days, it is dominated by performers like Keith Urban, Carrie Underwood, Zac Brown. I can’t name them all because I don’t really like what they do. Today’s country seems like a Frankenstein’s monster to me. Take a little bit of country. Take a little bit of rock. Throw in a few more things. Once, you are finished a monstrosity has been created. Personally, I blame Garth Brooks. Nashville didn’t become “Music City” because of today’s stars. 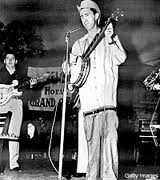 It became “Music City” in the early part of the 20th Century because of a radio show, the Grand Ole Opry. 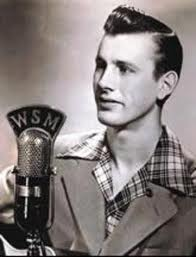 It could be heard every Saturday night on WSM, a powerful AM station that took its signal throughout the United States. 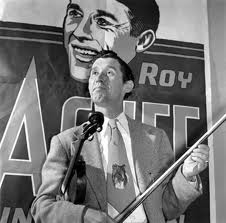 In the days before nationwide concert tours, artists could get their music to the masses over the radio. Since the performers gathered in Nashville to perform on the Opry, it made sense for record companies to set up studios nearby. 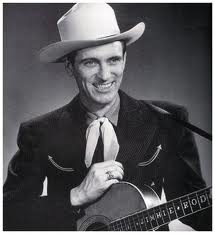 As years passed, Nashville became the destination for those who wanted to get in the country music business. Sometimes, I think that story gets lost in the glitz and glamor of the modern country music industry. 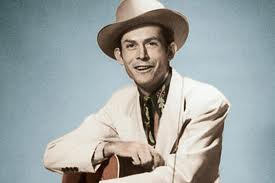 In the old days, country artists didn’t have laser shows at their concerts. They definitely didn’t run around the stage and shake their asses. They stood behind the microphone and sang about heartbreak and trains. 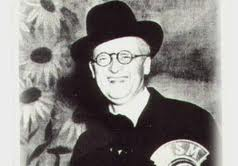 Jimmy Martin was one of the old-time singers. 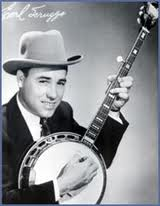 Known as the “King of Bluegrass”, he performed on the Opry many times. 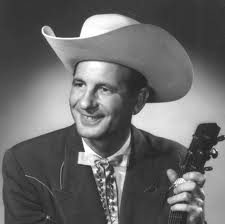 Unfortunately, he faced the demons of alcohol abuse, and uncertainty kept him from becoming a full member of the Opry. 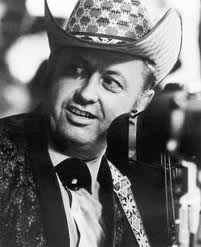 Despite that, he recorded “Grand Ole Opry Song“, an ode to the show and the people who made it special. I thought it would be interesting to use that song to introduce (or remind) the blogosphere to some of the people who turned Nashville into “Music City”.